And so we have two new saints: John XXIII and John Paul II. Are we lucky! We, in Rome, are particularly so, because the sanctification took place right here. Rome is the Holy City of Catholicism. A sort of Italian Jerusalem, so to speak. They say Jerusalem is the navel of Israel, which is in turn the navel of the world. Well, I will say that Rome is the navel of the world and the Vatican is in turn the navel of Rome, and St. Peter’s Cathedral is the navel of the Vatican. And therefore, the whole thing took place in a belly-button! I’m not exactly a Catholic, although I was baptized and raised in a very Catholic family. Well, I’m not exactly a believer, either, although I envy the believer, somewhat. And there were so many believers attending the ceremony. I only watched part of it on TV. I couldn’t have gone. Not only because I’m not a (good) Catholic, but also because I wasn’t prepared to wake up at three in the morning and queue for hours. Nor did I Intend to sleep in the Piazza. Which the pilgrims did. Lots of them. They all looked and sounded very happy. They cheered and applauded, and prayed and laughed and shed tears. It was moving even for me. Comforting. They do believe. 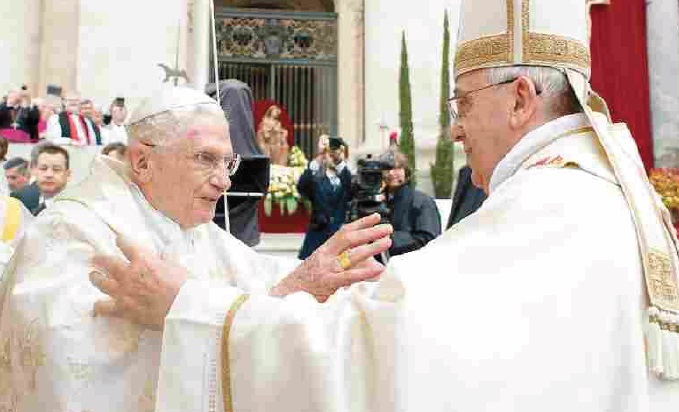 What struck me the most about the whole thing was that for the first time in history, two popes were there: Benedict XVI and Francis I. Two popes for two popes being made saints. History in the making, right? Concerning popes (not saints): do you like science-fiction? Well, you should know that in Italy a quarterly is published by Mondadori, entitled Urania, an icon for science-fiction lovers. It’s been there forever or so. I’ve translated quite a few pieces for Urania and published two short stories in it. The news is that in 1978 Urania published a collection of stories by American writers. 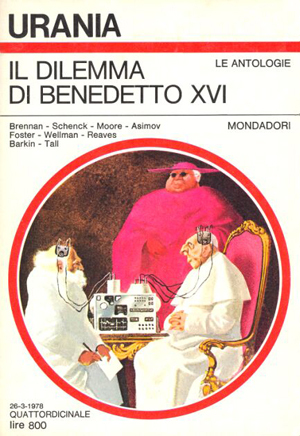 The title of one of the stories was translated into Italian as “The dilemma of Benedict XVI.” Google it. The original title was “The Armageddon Decision.” Why was it translated that way? Because the pope’s name in the story is Benedict XVI. Visionary writer. I’d like to have written it. As for Francis, a few months ago I was asked to write an article on him. Title: “Is the Pope a Communist?” I won’t tell you what my answer was, but I’d sure like to know what yours is. Popes keep us very busy in Rome, lately. AMC was born in Sassari, Sardinia, and moved to Rome when she was 7. She has lived in NYC and London and currently teaches cultural anthropology in Rome. For more writing on frankmatter by the same author, click here. This entry was posted on June 16, 2014 by frankmattermag in essay, italian.